Before we get into the details of the giveaway, I've included links to my reviews of these items as a little recap of each. I've also included a link to the corresponding product page if you're interesting in picking one up (that and you can enter to win the item outright). I love this pen, I really do. 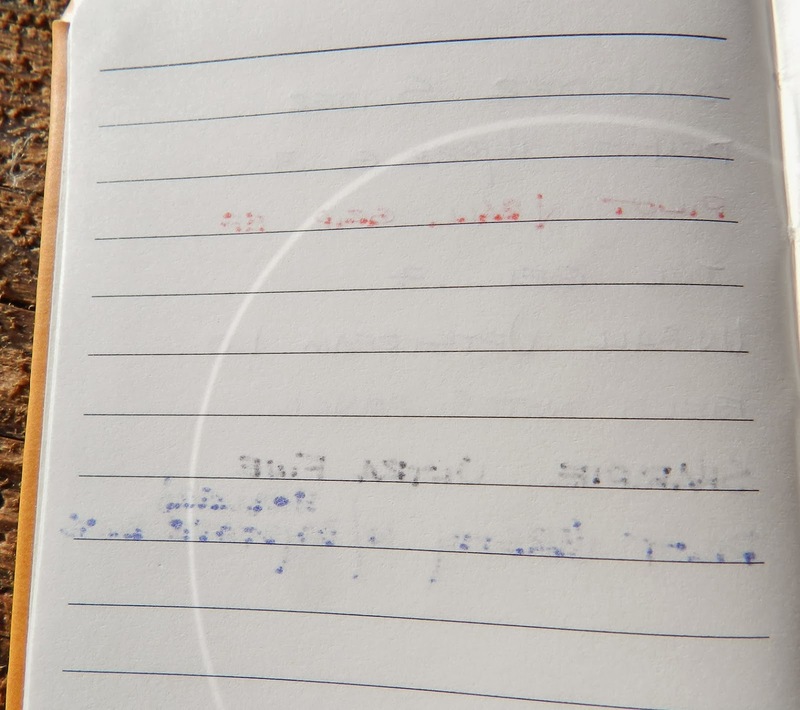 One thing I can ding it for is that it tends to dry out between uses, so you will receive this, wonder why it's not writing well, and will then remember that I suggested that you write in circles until the ink flows. If you use this pen all of the time, I'm sure it will behave. I dig the retro appearance, including the little submarine window, and you can change out the refill with a few other types of cartridge, so that's a huge bonus. I think the Acroball is hugely underrated, as is the Dr. Grip. I'm not saying the Acroball isn't popular, because it is, but I'm surprised it's not more readily available and talked about. I've said it multiple times before, but I think the grip on the Acroball is second to none. You can get this pen in a variety of colors, tip sizes, as well as a multi pen format. An industry-leading gel pen, and for good reason; this pen is a joy to write with - the ink is opaque and smooth, the ball leaves consistent lines on the page, and this pen is available in loads of different colors and sizes. This blue-black offering was exceptional, by the way. The Frixion was surprisingly fun to use - and the erasable ink feels a bit spy-like. The fine point wrote very well, and the fairly washed black ink was not undesirable in this case; the grey character of the ink alludes to a lack of permanence (but you can, so I've heard, bring the ink back with cold). I enjoyed this one very muc, and I'd still love to try the Frixion Point, too. We all know the Jetstream line, but you may not have tried the BLX variant that offers traditional colors, such as green, brown, purple in a combination with black, resulting in professional colors that have a less conventional, fun undertone. As you'd probably expect, this Jetsream wrote very well, and the green-black was a welcomed deviation from my normal color choices. If I had a more graceful hand, I'm sure I'd get more use out of this one. I like the pinkish-red color, very romantic. And the 1.5 mm ball a very different experience - like a pin ball on ice (smooth is what I mean). 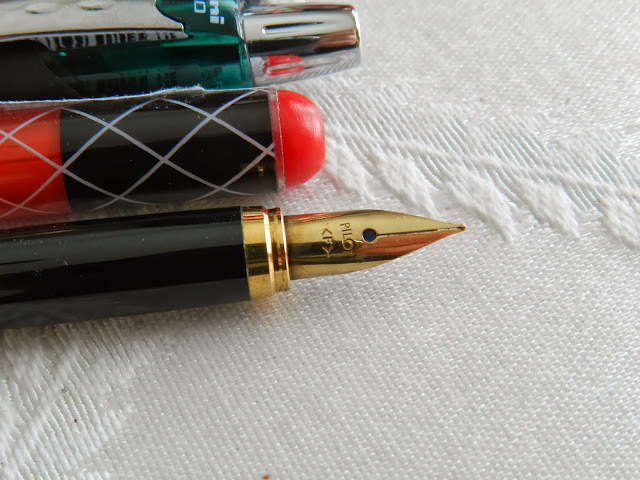 I'd like to check out the black, possibly as a good signature pen. I bought this one and never got a chance to review it. It comes with a converter, too! There's some toothiness that needs correction, and I'd rather not ruin the pen by adjusting the tines too much, so I am passing this one off with the rest of the herd. Some of these items I received at no charge to review, others were purchased. 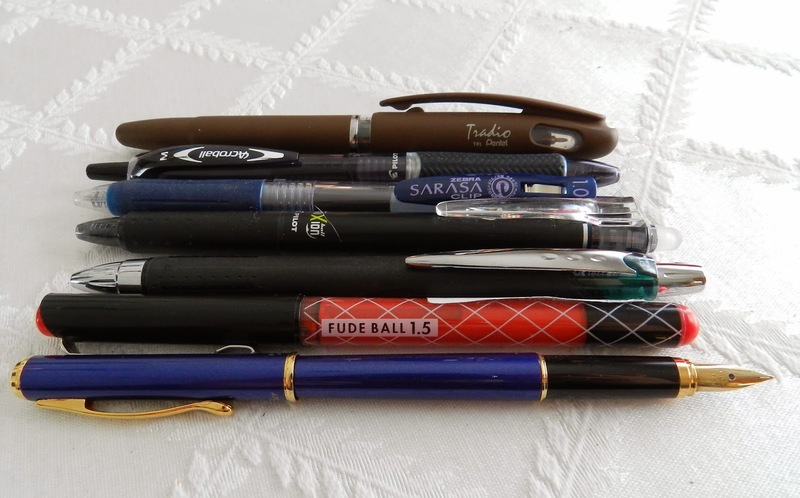 I'm dong this to both give out some cool goodies, as well as to generate interest in some of these items on JetPens. I'm working on a sponsorship and would like to continue to write honest reviews and send out most of the items I try, so that's why this giveaway is a bit different. 1. Leave one comment on this post. Please enter a name of some sort so I don't have to announce 'Anonymous' as a winner. This will count as your first entry. 2. Place an order at JetPens and leave a comment with your order number. I don't care if you order something for a dollar, but the order number must be placed as of today or afterward. By commenting with your order number, you qualify for a second entry in the giveaway. Entries will be accepted between now and 11:59pm, December 31st. The winner will be posted within a few business days afteward. Grandluxe was kind enough to send me a variety of notebooks to try (stay tuned for some giveaways), among them being the Monologue line. 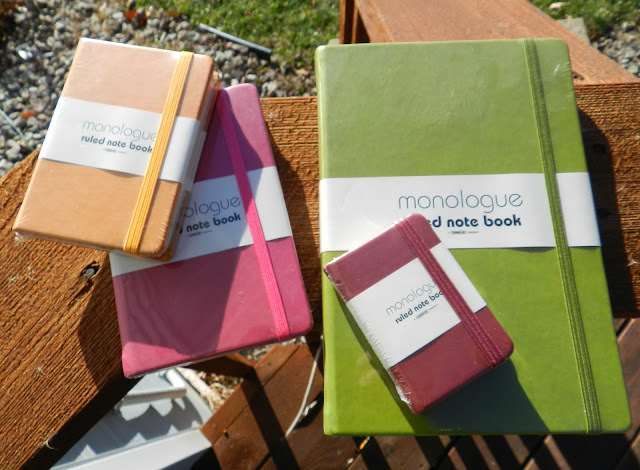 Shown above are four different sizes, and colors, of the their 'ruled note book'. As you can see from the information on the back, these are Made in Malaysia. The paper is cream, acid-free, 80gsm. 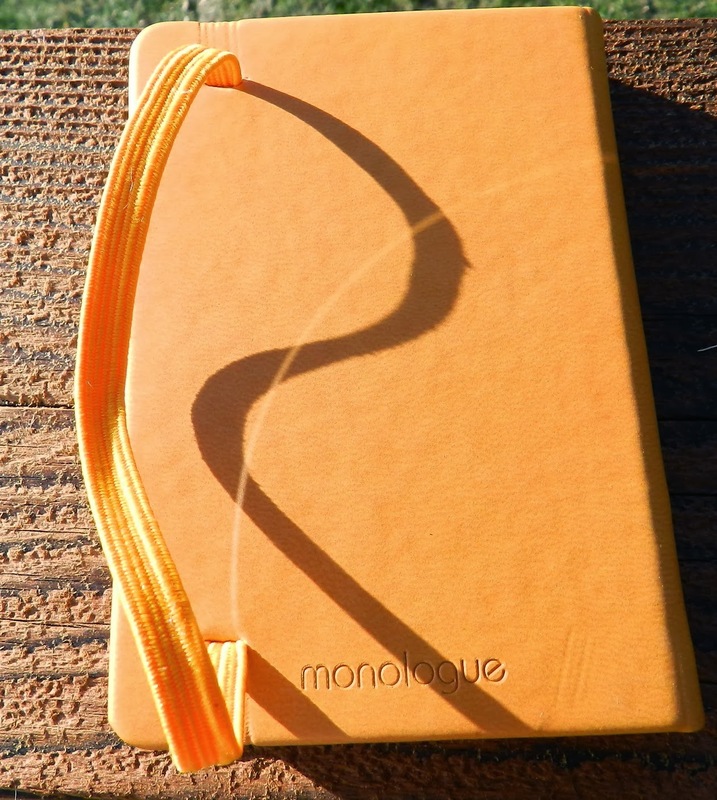 The build quality seems on par with many high-end brands, and the range of colors and sizes available would appeal to just about any taste, so long as you don't mind the format (elastic band, faux leathery-type material, etc.). I tried a variety of writing implements, and the writing experience was quite nice. 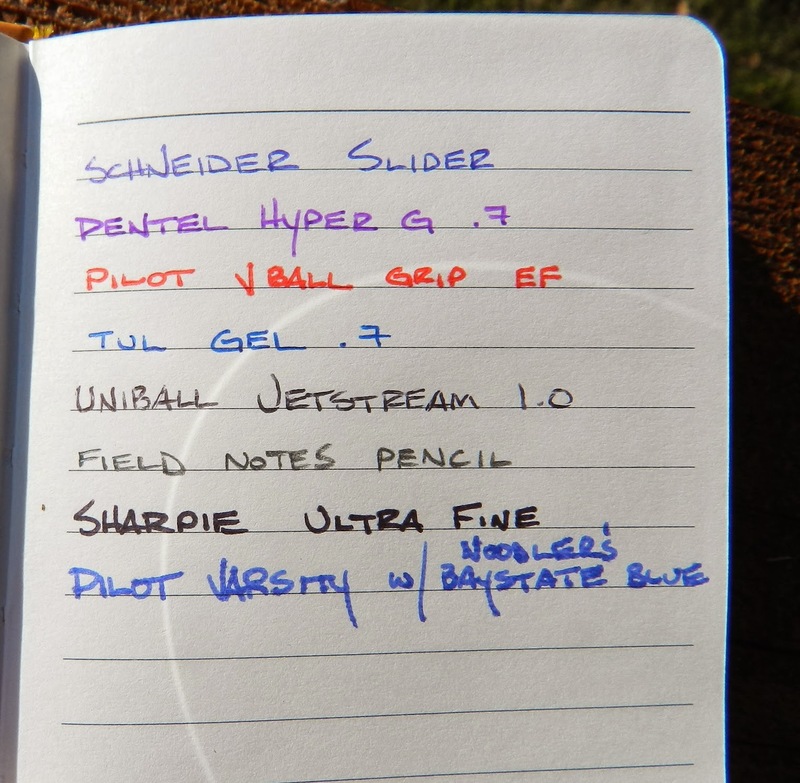 There was some feathering with the liquid ink pens, but liquid ink pens almost always feather, which is the primary reason why I tend not to like them, though I love some of the hybrid ink pens that are out there. As one might expect, the Sharpie was visible on the other side, as were the liquid ink pens. Everything else that I used would allow you to use the other side of the page, though some of you may not mind writing over bleed through like this. I cringe just thinking about that. 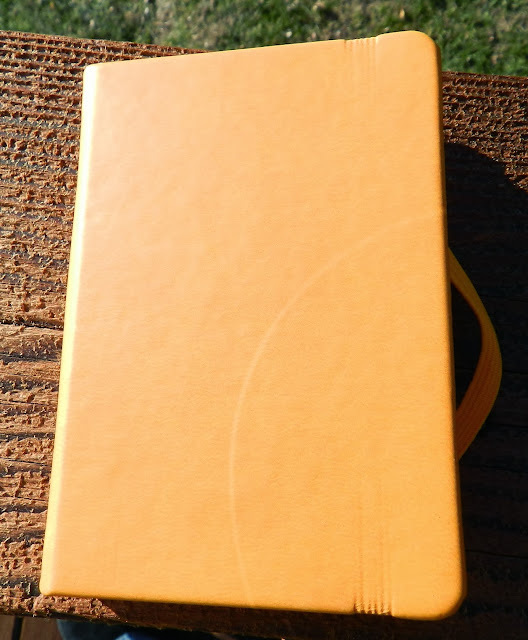 For my preferred color preferences, the orange was pretty sweet, and I do like the elastic bands. 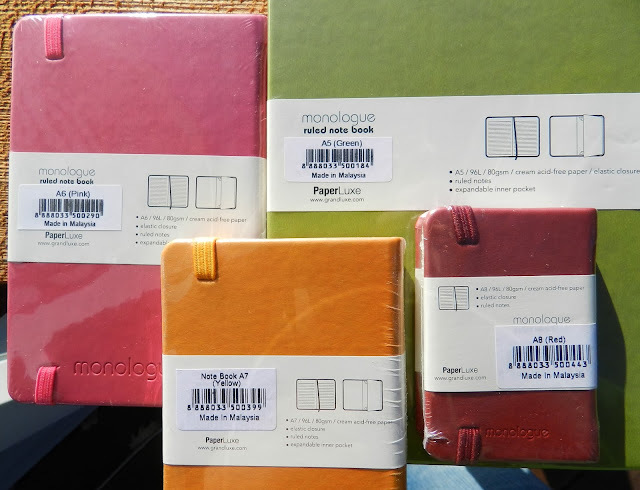 When I use notebooks like this, I stash cards, coupons, loose paper, under the band. It keeps me organized. For better or worse, the elastic band is tight enough to make indentations in the cover. I don't think the band is on there crazy tight or anything, and I like knowing that it's secure, so long as it holds up over time. We shall see.